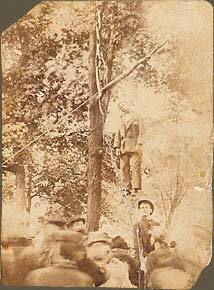 The lynching of Charles Mitchell, his body hanging from a tree in a courthouse yard. June 4, 1897, Urbana, Ohio. Cardmounted gelatin printingout paper. 2 1/4 x 3 1/4"